I would suggest reducing your squad size a tad and bringing in some cash to reduce the debt ! Maybe flog off some of the under performing high earners and it would perhaps make team selection a bit easier. Still think you'll make the play offs but that increasing debt would worry the nuts off me. Can you give us a bit of an insight into your scouting methods ? Do you only sign 5 star rated players or any star rated players which your scouts find ? Also how many scouts do you have and isnt it costing you a lot to send them out, erm, scouting around the world ? •	No idea how you are still so close. Granted – an unbeaten month but a LOT of dropped points. Crazy league where seemingly not many of the higher teams can put a run together – so you’re not alone there! •	Mad record from Bonne and always has done – loves being the main man up top and belying his average atts! What I meant was that there was a 4 point gap at the start of January to the playoffs and we've closed it down by a point after February. Bonne's becoming a legend. Tres Bonne! I went through the numbers with Redders to show what our top wage earners are, there's not really that many players on big wages at all. The problem is we're only pulling in about 50k a month in gate receipts though I think we did only play two games at home last month. With that 25% sell on clause, you could get Sundstrom on the cheap if you ever need another Swede and had money to spend. Looks as if the playoffs will now be your best hope. He's a regular at Bolton though so doubt we'd be able to get him either way! I personally think as long as Tres plays, you'll do it! We'll see! Not yet done today's update! I know, I'm patiently awaiting it! Moving into March, I had one aim in mind and that was simply to build on our seven game unbeaten run and turn some of those draws into wins. There were 12 games left of the season which meant 36 points to be recorded and we were by no means ruled out of finishing higher than our current placing of 9th. Reverting back to my usual ambitions of bettering last year's position and/or point tally, we needed to record either 28 points or simply climb up at least four places. However, as we had players away on international duty, we didn't feature during the first weekend of the month which saw us pushed down to 10th but could reach 8th if we were to win our game in hand. But we were dealt bad news when learning of how our international players got on. Chris Willock had not played for Montserrat for four years and had only recently earned his first call up as a Leamington player. He was handed a start to earn his 3rd cap for his county but lasted just 26 minutes after suffering a torn groin muscle that has put his out of action for 2 months, potentially ending his season. He's not exactly been a key player but had featured 23 times so far this season and would be a miss. Montserrat had drawn 1:1 to Anguilla. Elsewhere, Janoi Donacien won a 19th cap in returning to the St Lucia side for the first time in nearly two years. He played the full game and impressed in a 1:1 draw against Dominican Republic. We also had players facing each other for the first time ever as Anfernee Dijksteel also earned a first cap as a Leamington player in his second cap for Surinam, featuring at right-back for 54 minutes as they won 2:0. Sadly for DJ Buffonge, he was on the losing side for Antigua & Barbuda (as was one-time loanee Rhys Browne) and struggled on his 11th cap before being subbed just after an hour. A full programme took place on a Wednesday evening with ourselves travelling to Scunthorpe (12th). Willock had started our last game at left wing so he was replaced by Jamie Byrne and there was a surprise start for Piotr Maczynski who has started just once this season. He replaces Connor Smith whilst a fit again Inaki Valenzuela Lozano also returned in defence as Scott Barrow lost his place and Donacien lined up in the middle. I felt reasonably confident going into the game but that was blown out of the window after just 9 minutes as Scunthorpe scored twice. Thankfully, Maziar Kouhyar (8) got us a timely goal in pulling one back after 41 minutes and we were right back in it when Macauley Bonne (21) equalised right before the whistle! I really thought we could go on and win it, even more so when Caolan Lavery came on in the second half but we lost to a 86th minute winner which puts us 12th. Pastoor 6, Valenzuela Lozano 7, King 6, Donacien 6, Dijksteel 6, Sousa Silva 6, Eisa 7 (Lavery 6), Kouhyar 8 (Marsh 7), Bonne 8, Maczynski 7, Byrne 7 (C.Smith 7). I actually wanted to name an unchanged team to welcome Wolves to our home but after working hard in midweek in his first start for a while, Maczynski was left out with Connor Smith starting as the only change. This time, we take a lead after a bright start with Kouhyar (9) putting us ahead with Byrne registering a first assist of the season. Though Wolves rarely threatened, I was always worried they'd hit us with a sucker punch but the team did me proud to confirm a win that puts us back into 10th place. You may be surprised to learn that Byrne's start was his 146th appearance for Leamington and he overtakes Tony Breeden to hold a new club record! Pastoor 7, Valenzuela Lozano 6, King 7 (Muleba 7), Donacien 7, Dijksteel 9, Sousa Silva 7 (Stokke 7), Eisa 7, Kouhyar 8, Bonne 7, C.Smith 7 (Lavery 7), Byrne 7. In other news, wantaway rebel Sonni Nattestad has earned a call up to the Faroe Islands squad despite playing just 17 times this season. We now play our game in hand against Tranmere (7th) where I make it clear to the players that we simply have to win to keep our hopes alive of promotion. A win on this Tuesday evening would put us 8th and just a point behind Tranmere themselves but there was one problem. We'd have to do it without Bonne who injured his neck in training and is ruled out. After some deliberation, I name Lavery as the lone striker to replace him whilst also replacing Tom King, moving Donacien to left-back and bringing in Jonathan Muleba for only a second start of the season. Maczynski also returns for Connor Smith. Once again, we make the perfect start at home as Mohamed Eisa (3) puts us ahead and Lavery (4) himself doubles our lead. Eisa scores again (4) to give us a fine lead and Lavery (5) gets his second of the game too to wrap up a fine win which is only soiled by a lack of a clean sheet with Tranmere scoring in the 80th minute. But I didn't care about that as we move into 8th. Pastoor 7, Valenzuela Lozano 8, Donacien 7, Muleba 6, Dijksteel 7, Sousa Silva 9, Eisa 9 (C.Smith 6), Kouhyar 7, Lavery 9, Maczynski 8, Byrne 8. Goals - Eisa x2, Lavery x2. Assists - Byrne, Maczynski, Sousa Silva. It's internationals time again and thankfully there are no injuries to report this time. Buffonge is on the winning side this time after 90 minutes as Antigua & Barbuda defeat Dijksteel's Surinam 2:0 which takes the game on penalties only for Surinam to win after a 4:3 shoot-out. Ironically, Dijksteel missed Surinam's last penalty but they win anyway. Meanwhile, Donacien's St Lucia draw 2:2 against Dominican Republic to go through to the next stage of their World Cup qualifiers along with Surinam. After the extra time and penalties, Dijksteel looks tired when he comes back to us for the trip to Coventry (20th) so his place goes to a fit again Harry Kyprianou. With Bonne still out, Lavery carries on deputising up front. We've had early goals in every game so far this month and this one is no exception as Coventry find us sleep walking as the game kicks off to lead 2:0 after just five minutes! I'm left outraged on the touchline and even more so when a Kouhyar goal gets ruled out just five minutes later. But goals from Eisa (5) and Kyprianou (2) drags us back in it but for Kouhyar to be harshly given a penalty against him. Wouter Pastoor is unable to save it to stop Coventry retaking the lead but Lavery (6) cancels it out. This is all in a frantic first half! We look much better in the second half as Lavery (7) puts us ahead at last and a Byrne disallowed goal means we could have had six goals! Six could have been seven as Lavery (8) then gets a hat-trick to complete an astonishing comeback and at last, we break into the playoffs for the first time this season as we're now 6th! Pastoor 6, Valenzuela Lozano 7, Donacien 7 (King 7), Kyprianou 6, Muleba 6, Sousa Silva 8, Eisa 8 (Wells 7), Kouhyar 8, Lavery 10, Maczynski 7, Byrne 7. Goals - Eisa, Kyprianou, Lavery x3. Assists - Maczynski, Kouhyar, Sousa Silva. I have a real selection headache for our next game as Bonne returns to full training and he starts up front with Lavery dropping back into the number 10 role as Maczynski unluckily makes way. A second change sees Dijksteel back in for Muleba and we're set to go against Ebbsfleet (10th). Lavery turns provider to set up Eisa (6) and after 69 minutes, Maczynski gets to come on and sets up Kouhyar (10) within a minute to complete a 2:0 win! Pastoor 9, Valenzuela Lozano 7, Donacien 7, Kyprianou 7, Dijksteel 7, Sousa Silva 8, Eisa 8 (Wells 6), Kouhyar 8 (Marsh 6), Bonne 7, Lavery 8, Byrne 7 (Maczynski 7). Elsewhere, Nattistad doesn't feature for Faroe Islands but we learn of callups for Bonne (Zimbabwe), Eisa (Sudan) and Muleba (Burundi) for their World Cup Qualifiers. We play the last game of the month against Northampton (10th) without Donacien and Dijksteel who are away with their countries. Their places go to King and Muleba as the only changes for a game in which, if we win, could see us move into 5th. A first assist of the season for Valenzuela Lozano sets up Bonne (22) but that good work is ruined as Northampton equalise just after half-time and then go on to score a winning goal to give us a real kick in the nuts as they had just two shots and scored with both! Pastoor 6, Valenzuela Lozano 7, King 6, Kyprianou 7, Muleba 5, Sousa Silva 8, Eisa 6 (Maczynski 7), Kouhyar 7 (Taravel 7), Bonne 8, Lavery 7, Byrne 5. Elsewhere on the globe, Donacien is involved in a 1:1 draw against Barbados as St Lucia's World Cup Qualifying campaign continues and Dijksteel wins 2:1 with Surinam against Puerto Rico, coming on as a 60th minute substitute. I am absolutely gutted to have lost that game against Northampton and also at Scunthorpe when we had done well to come from 2:0 down. An extra six points in both games could have put us 5th but it's not the time to focus on the past. Instead, we look to the final six games of the season with the club in 7th place, 3 points from 5th but 7 from 4th. Next month will pretty much be make or break! Finally, we are seeing the team come together with some excellent performances throughout the side. The last game excepted, we've had consistency from Pastoor, Byrne, Valenzuela Lozano, Donacien, Dijksteel and Sousa Silva. The goals are flowing from Kouhyar, Bonne and Eisa and I'm chuffed to see Maczynski finally fight his way back into contention too. Lavery though has been the top dog this month in scoring five goals! It's been nearly two years since one time club captain Liam Francis left us to join Fylde on a Bosman. Unfortunately, we do not know what he is up to now as he has retired from the game so we turn our focus to the next player - Lorenzo Musto. Joining us at the same time as Bonne, many would have expected the Italian to rip it up for us, including myself but it just didn't work out as he scored 14 times in 30 games before we opted to sell him to Alessandria for £250,000. Now valued at £95,000 and 28 years of age, Musto is still in his native Italy but has played only 16 times in two seasons, scoring 7 goals. Just had a quick look while the save is open. Last month wage bill was £343,372 My scouts are only earning between £400-£600 though. Yep, youth searches often find only UK based players which is a shame. Northampton are a bit of a bogey side. They seem to beat you every time you play. Otherwise a great month and right back in contention. Even if you finish 7th and with less points than last year, it must be seen as progress if you win the play-off final. Just keep Laverey, Kouhyar, Bonne and Eisa on form and you should do it. •	Musto scores 1 in 2 for you and you ship him on………. •	And he’s basically 1 in 2 again now – the guy can’t get a break! Cant believe you were still in the playoff hunt, but March has certainly put you in with a great chance. Goals this month! Wee Sundström has become a lovely player, fantastic but of scouting from your boy. Big month ahead, can it be anither playoff and third time lucky? Those 4 players are massively key. Sousa Silva too is doing well at DMC. It's just the defence that need to behave too! Haha, Byrne is the awful looking FL who came through the academy. Yet he keeps getting in the team due to getting 7s quite a lot but not a lot goals/assists. Third time lucky would be nice! Let's find out! I had labelled last month as make or break. We 'maked' and we made it into the playoffs. But there's now five games to play this month to try and consolidate that position. 15 points which could see us on 76 points which is only four more than Crewe are currently on. If we can put a winning streak together, anything can happen! At the very least, I am aiming to catch Barnsley who are only three points clear. We have nine days to gee ourselves up for the run-in, during which we suffer two training ground injuries. The first is 33 year old German Markus Schwabl which I'm not too concerned about. He's only started 12 times and Inaki Valenzuela Lozano has moved ahead of him recently. The second is a major blow for he's one of our key players who have been in top form. Maziar Kouhyar has suffered a groin strain and his season is effectively over unless we do qualify for the playoffs! Meanwhile, the reason we don't play is due to international games but we drop to 9th as we don't feature. Mohamed Eisa gets a 20th cap for Sudan and helps them to a 1:1 draw against Ghana, playing the full game of their first round first leg World Cup (AFR) Qualifier. Macauley Bonne also comes on after 65 minutes for a 6th Zimbabwe cap at the same stage but lost 2:0 to Egypt. In other news, Sonni Nattestad is called up for Faroe Islands. Tarek Taravel gets the ball to replace Kouhyar in midfield in only his 6th start of the season. The 20 year old Frenchman has 3 goals in 8 appearances for us and can hopefully fill the void against Barnsley (5th). Three other changes are made as Anfernee Dijksteel and Janoi Donacien return in place of Tom King and Jonathan Muleba after missing out due to internationals last time out. The other change is a return for Piotr Maczynski for Jamie Byrne on the left wing. This is a big game given where Barnsley are and the players buy into it, looking solid at the back even though Barnsley have more chances, they have only two on target and we score in a three minute spell to win 2:0 thanks to Bonne (23) and Maczynski's first of the season which puts us 5th! Pastoor 8, Valenzuela Lozano 7, Donacien 7, Kyprianou 7, Dijksteel 8, Sousa Silva 8, Eisa 7, Taravel 7, Bonne 8, Lavery 9, Maczynski 8. Up next is Barnet (8th) three days later and once again, we're missing Dijksteel and Donacien due to international duty so King and Muleba are brought back in whilst Taravel is also replaced buy Jak Marsh starting his 12th game of the season. Thankfully there's no other changes as the players do look fit as we try and push with our playoff ambitions. However, Barnet score the only goal of the first half but we are in the mix and Maczynski sets up Muleba for a first goal of the season with a header that crashes in off the post. Having fought to get back in the game, I'm left staggered as Barnet strike twice through Shaq Coulthirst to win the game and the result puts us 7th. Pastoor 6, Valenzuela Lozano 7, King 6, Kyprianou 6, Muleba 7, Sousa Silva 6, Eisa 6 (Wells 7), Marsh 8, Bonne 6, Lavery 7 (Byrne 6), Maczynski 8. Donacien does taste victory though with St Lucia as they beat Barbados 2:1. He starts and comes off after 87 minutes on his 22nd cap which is fortunate as the game went to extra time before they won to go through to the 3rd Round of the World Cup Qualifying campaign. Dijksteel also goes through with Surinam as they beat Puerto Rico 2:0 but he did not feature. We could have done with him at home! We play our next game on the Monday, which is awful timing meaning we'll have played three games in six days! Naturally, there's tired legs for this one so Inaki Valenzuela Lozano, King, Harry Kyprianou, Luis Sousa Silva, Mohamed Eisa, Marsh, Bonne and Maczynski. Replacing them to face MK Dons (17th) are Donacien, Dijksteel, Alen Agovic, Erik Stokke, Taravel, DJ Buffonge, Byrne and Adam Nelson. We could had the perfect start when we won a penalty thanks to Lavery being fouled in the box but Buffonge's effort was saved by the MK Dons goalkeeper. MK Dons have just one shot all game as we dominated and the chance to move up the table seemed as though it was disappearing when all of a sudden, Agovic beat his man to power home a header, scoring his first goal of the season in only his second start which brings us back to 5th place. Pastoor 7, Dijksteel 7, Donacien 7, Muleba 7, Agovic 7, Stokke 7, Lavery 7, Taravel 7, Nelson 6 (Powell 7), Buffonge 7 (Wells 8), Byrne 6 (W.Smith 7). Byrne has been handed an unofficial warning after turning up late to training and looking unfit. It's a surprise to me as he's never been a problem in the seven years he has been in the squad since graduating from the academy. Meanwhile, our game at the weekend is pushed to Wednesday due to African World Cup Qualifiers. Eisa plays the full game in the return leg against Ghana but sadly Sudan will go no further after they lost 2:0. Bonne did not play at all as Zimbabwe drew 3:3 at Egypt and go out 5:3 on aggregate. We head to Altrincham (18th) in 6th having dropped on place over the weekend without playing. But we are lifted by the fact that if we win, we will move into 4th! The rested players are recalled but our latest graduate Dominic Wells has earned his first start on the right wing after eight appearances off the bench. However, he comes off at half-time after complaining of a knee problem and I'm left hoping for another late goal to get us into that 4th place but it doesn't come as the game ends 0:0, leaving us 5th on goal difference. Pastoor 7, Valenzuela Lozano 7, Donacien 7, Kyprianou 6 (King 7), Dijksteel 7, Sousa Silva 7, Wells 6 (Eisa 7), Marsh 7, Bonne 7, Lavery 7, Maczynski 7. The last game of the month is a tough one, at home to the already promoted Crewe (1st). Having played only three days ago, Lavery is left out as Eisa comes in in his place. Two other changes sees King replace Kyprianou whilst Wells makes way for the return of a fit again Chris Willock after two months out injured. With two games left of the season, the tightness of the league means that we could still finish as low as 13th. So the brief is to simply try to avoid defeat but Crewe lead 1:0 at half-time. There's tired legs at the break and I make a triple change but it does not help matters as Crewe score another two goals. Defeat leaves us 7th with everything riding on our last game. Pastoor 6, Valenzuela Lozano 8, Donacien 7, King 7, Dijksteel 6, Sousa Silva 7 (Stokke 7), Willock 6, Marsh 7, Bonne 7 (Nelson 7), Eisa 6 (Wells 6), Maczynski 7. Twice we have missed the chance to move into 4th place and instead we are left in 7th. Teams are far down as Macclesfield in 11th can still catch us as it leaves us requiring a win at Exeter (16th) to secure a third playoff place in a row. The perfectionist inside me is gutted as we are going to have to rely on Northampton and Barnsley to lose if we are to match our best ever finish of 5th. Unless we do indeed secure a playoff place but make it through it this time! Janoi Donacien, Inaki Valenzuela Lozano, Piotr Maczynski and Caolan Lavery have all been decent this month but the fact that Maziar Kouhyar still has the best form in the squad shows that we've probably missed him this month. Both Taravel and Marsh have filled in but did not have the effect that Kouhyar has in games this season and if we can just get through the Exeter game, Kouhyar will be available for the playoffs. Looking at the players we've had in the past, I've realised that we've not focused on loanees over the years as well. Marc Lancaster was in fact my very first deal in January six years ago when coming in on loan from Blyth Spartans. The left-back, now 30, was my first Englishman at the club and started 14 times, scoring once and had an average rating of 6.86. However, he was always a stop gap at the time and I never considered bringing him back. 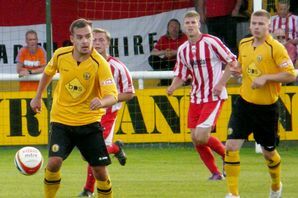 Lancaster had another loan spell at Stocksbridge the following season before joining Chester-le-Street in a £10K deal. He's since started 227 times for them but remains in the non-leagues. All boils down to the final game of the season!!!!! If only those 11 draws turned into 5 or 6 wins and you'd have been promoted!!!! A nailbiting end to the season. Who do Northampton and Barnsley play ? What are the odds on Northampton in the final ? •	Bad time to lose 2 key players on Int’ duty v Barnet! •	Phew – key win over MK Dons! •	Out of character from Byrne – maybe the record he has just got went to his head! •	Away isn’t oideal – and neither is to a lower table team that seemingly you sometimes struggle against – but with the lads knowing what is on the line SURELY you can win this one?! •	What’s squad fitness/selection looking like ahead of it? •	Not sure why you show Kouhar as one of this months players when he didn’t play? Would have thught some praise for someone else during the month who played? It really does show how tight it's been all season round. If only we'd got our acts together earlier, we could have been right up there! Northampton play 8th placed Fleetwood at home, so a toughie for them. Barsley also at home, to 18th placed Swindon. To make things more interesting, we've played Exeter three times and never won. Drew twice and lost the other. It's not player of the month, but who's the most in-form player in the squad. Schwabl back from injury but Kouhyar won't make it. Yup, haven't we been here before? Yep, that's true. It should give opportunities to others to come in and stake a claim for a first team spot. It's allowed Muleba to break back in recently which is good! But we definitely missed the steel man!